Arthur Lake portrays the role of Dagwood Bumstead, based on the comic strip by Chic Young. Lake starred in 29 Blondie motion pictures, and reprised the role on radio. This sitcom was basically the retelling of stories and situations familiar to readers of the comic strip. Only 26 original episodes were produced. We’ve managed to put together a collection of 20 of these delightful shows for you. Included on Disc 6 is the original movie that started it all. 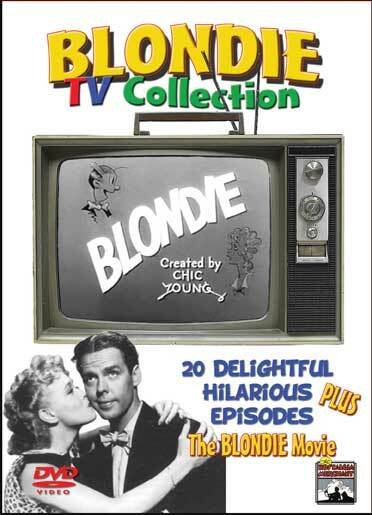 Pilot Show , Dagwood’s Ego, Mr. Dithers Hositalized, Mr. Dithers Move In, Get That Gun!, Husband Once Removed, The Quiz Show, The Payoff Money, The Lamp, Blondie, The Breadwinner, The Rummage Sale, Deception, Puppy Love, Made to Fire, Blondie Redecorates, The Spy, The Tramp, The Grouch, Alexander’s Birthday, Howdy Neighbor, Blondie, the Movie (1938).